The African wild dog is a canine of many names. Lycaon pictus is Latin for "painted wolf," and the Cape hunting dog does indeed look painted. With long legs and erect ears, the African wild dog, or spotted dog, also bears a spotted black, white and tan coat. Originally, the painted wolf roamed the forests, arid regions and savannas of Africa, but as threats increase and population dwindles, the canid has become more elusive. In the past, the spotted dog could be found across sub-Saharan Africa, sometimes in packs of up to 50. The wild dog inhabits deserts, tropical forests, tropical grasslands and flooded wetlands. The tropical grasslands bear drought-resistant vegetation in the dry season and diverse nutrition to grazing animals during the wet months. Flooded grasslands are part wetland, part grassland, and are marshy homes to a large bird population. Dry, tropical forests offer protection to ground-dwelling animals, while the desert is a region of hot days and cold nights. Litters of up to 20 pups have been recorded, with 10 being average. Breeding females typically give birth once a year in a bush, grass or a hole, caring for the young, while males deliver regurgitated meat for the brood after a hunt. Death rates of African wild dog pups are surprisingly high. Dens are susceptible to floods or disease, and when the numbers of a pack get too low, hunters are unable to bring back sufficient food for the young. Once the pups are 3 months old and ready to learn to hunt, the range of an African wild dog can extend almost 900 square kilometers. Heat-resistant impala live in herds in the tropical grasslands, eating seeds, leaves and grass, and are the preferred meal for the wild dog. Lions must be avoided, as they are known to eat both young and adult wild dogs, while thieving hyenas will snag a painted dog's kill if left unattended in open areas of the habitat. If food is scarce, African wild dogs can survive on birds and rodents. Today, the African wild dog's habitat faces an even greater threat in the form of humans and livestock. Thousands of wild dogs die at the hands of overprotective farmers and eager antelope hunters, who view the animal as a nuisance. Even in conservation areas, the painted wolf is at risk with a 50 percent mortality rate. 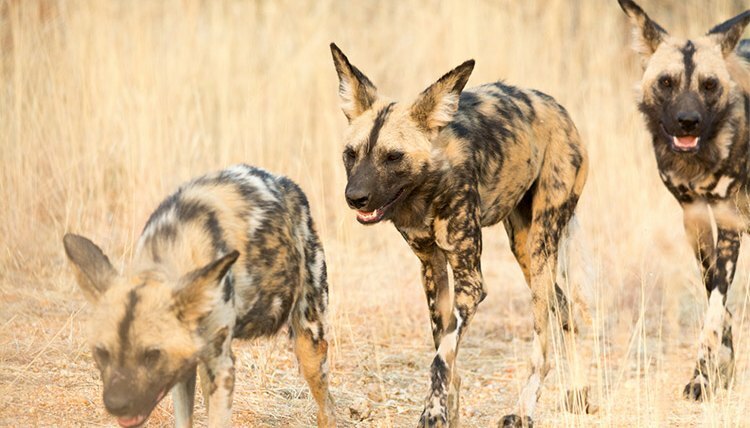 However, due to the fragmentation of the animal's population and extensive habitat, the African wild dog suffers even greater risks of mortality on the edges of conservation parks.